According to a brand new report from South Korea, Samsung's upcoming Galaxy S10 smartphone could feature a triple rear camera. Korean website The Information quotes a local analyst who says that Samsung is "considering" equipping the Galaxy S10 with such a camera possibly because Apple is expected to launch an iPhone X Plus with a triple camera sometime in 2019. The new report also reiterates a rumor about a 3D sensing sensor that could be included in the camera of the Galaxy S10 - this would allow the recording of high-definition 3D content, from selfies to stuff that can be used in AR (Augmented Reality). This 3D sensor does not necessarily require a triple camera. Still, having a triple rear camera should bring various other benefits, including enhanced optical zoom, increased image sharpness, and superior low-light performance. At this moment, the specifications of the triple camera that Samsung might use on its Galaxy S10 are not known. Anyhow, Huawei already released a smartphone featuring a triple camera on the back - the P20 Pro, which, as you'd expect, takes really good photos. 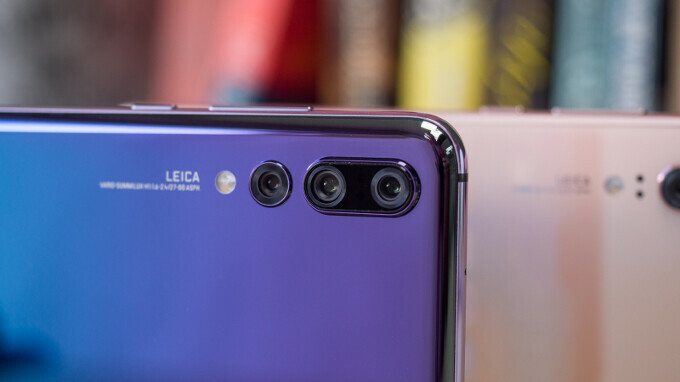 The triple shooter of the Huawei P20 Pro (pictured above) includes a 40 MP main camera for regular shots, a 20 MP monochrome camera, and an 8 MP telephoto (zoom) camera. Samsung may go for a relatively similar setup, but that's just a faint guess. A recent rumor had it that the Samsung Galaxy S10 series (likely including 5.8-inch and 6.3-inch models) could be announced in January 2019, less than a year after the Galaxy S9. We'll just have to wait and see if that's true. "Like Apple's iPhone X Plus" while the picture show P20 Pro. And we aren't even sure that iPhone X Plus will get triple camera, lol.. Heck, we didn't even know that the next iPhone will be named "iPhone X Plus" Can't you be more neutral and change the title to "Like Huawei's P20 Pro"
The title's idea is built around the word "could" - as in both the new iPhone and new Galaxy could feature triple cameras. The P20 Pro already has that, of course. It is so unprofessional what you are doing. Only P20 pro has 3 cameras not iPhone. Stop making it look like Samsung is copying apple. This is so stupid. Not your fault Florin, worldpeace often can't comprehend. I don't know what your intentions were, but please read the title again and tell me that title sounds like what you just said you were trying to imply. Technically, you're right.. "could" can refer to both Galaxy and iPhone, but because you separated the two phrases instead of within one, it definitely sounds like iPhone is already determined to have triple cameras. How about this? "Apple's 2019 iPhone X Plus and the Samsung Galaxy S10 could both feature a triple rear camera" You could even flip the phrases and mention the Galaxy S10 first and that even sounds more accurate. "Samsung Galaxy S10 could feature a triple camera, like Apple's 2019 iPhone X Plus"
The title is fitting because the analyst mentioned in the article directly says the reason the S10 would feature the three cameras is due to rumors of Apple doing the same. And he does go on to mention the P20 Pro being the device that everyone is trying to emulate or beat when it comes to the camera tech. So I would say it’s a fair article. Trust me, there are times I call out PA for bias or tipping the scale, but this isn’t one of those times. Samsung could use triple cameras to provide better features and not because of Apple rumors. That’s how Apple’s marketing engine works. They make it seem they hAve been copied even if they haven’t released the product. If you're being honest, you'll admit he did it to start a flame war. Does he have earlier article stating how the iphone might have three camera's like the p20? I don't think so. Exactly But then they would have to admit apple copies. I beg to differ. the reasons for Samsung to implement triple cameras are speculation, at best. it could be because of Huawei, it could be they are adding a wide-angle lens, like the LG, it possibly could be because they heard Apple may do it. who knows? it's not good journalism to add such speculation. not to mention, EVEN IF Samsung is just trying not to be outdone by Apple, this STILL is a misleading title. Thankfully if there is no notch! lets wait and see whos phone will come out with triple lens first...then we can say that the first one to come out with it has copied huawei.